'Villiers had emerged from his restaurant after an excellent dinner of many courses, assisted by an ingratiating little flask of Chianti, and, in that frame of mind which was with him almost chronic, had delayed a moment by the door, peering round in the dimly-lighted street in search of those mysterious incidents and persons with which the streets of London teem in every quarter and every hour. Villiers prided himself as a practised explorer of such obscure mazes and byways of London life, and in this unprofitable pursuit he displayed an assiduity which was worthy of more serious employment. 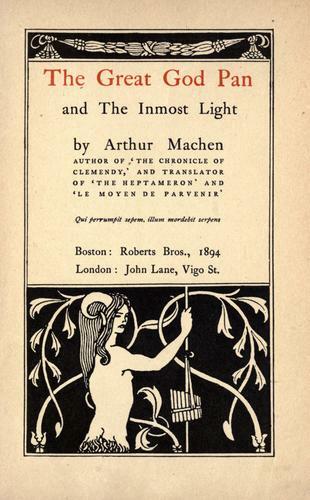 Thus he stood by the lamp-post surveying the passers-by with undisguised curiosity, and with that gravity known only to the systematic diner, had just enunciated in his mind the formula: “London has been called the city of encounters; it is more than that, it is the city of Resurrections" (The Great God Pan, 1894). 'I searched for Mrs. Beaumont in the dark waters of the life of London... assuming, as I had to assume, that her record was not of the cleanest, it would be pretty certain that at some previous time she must have moved in circles not quite so refined as her present ones. If you see mud at the top of a stream, you may be sure that it was once at the bottom. I went to the bottom. I have always been fond of diving into Queer Street for my amusement, and I found my knowledge of that locality and its inhabitants very useful' (The Great God Pan, 1894). OK I would have preferred 'All the wonders lie within a stone's throw of New Cross station' but the same principle applies! Spooky - I was reading The Great God Pan yesterday!